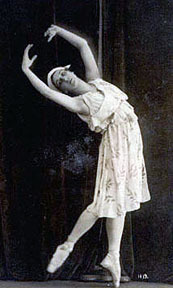 Image of Tamara Karsavina (1885-1978), one of Russia's greatest ballerinas; she was already dancing at the Mariinskii Theatre in St. Petersburg in 1905. Citing specific evidence from the Imperial Manifesto and the Fundamental Laws (not from the textbook), assess whether the Manifesto and the Laws established a constitutional regime in Russia. If you have not already done so, you can review the remarks by Professor Evans on 1905.